Frozen Lemonade 1956 Ad. 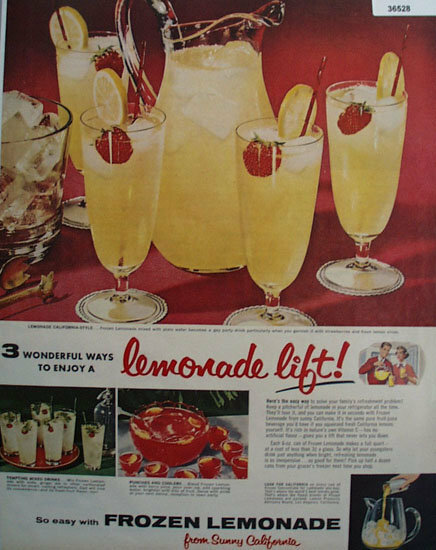 This color August 21, 1956 ad by Lemon Products Advisory Board, Los Angeles, California states 3 wonderful ways to enjoy a lemonade lift. So easy with frozen Lemonade from sunny California. Picture shows pitcher and 4 glasses of Lemonade with strawberries in them. Also shows tempting mix drinks and red punch. Magazine tear sheet picture is taken through plastic and may show wrinkles or crookedness that is not in the ad. This Original magazine tear sheet measures 10 1/4 inches wide by 13 inches tall. Items Similar To "Frozen Lemonade 1956 Ad"